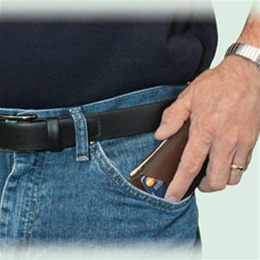 Back pocket wallets can cause damage to your spine through constant misalignment. This can compress discs, pinch nerves and create back pain. With a thin fold-flat design, the Back Saver Wallet will fit comfortably into a front pants pocket and will hold as much as a traditional wallet, but at 50-60% the size. Two interior and two exterior compartments will carry up to 24 cards. Spring clip holds bills conveniently and securely without taking up extra space. Clutter is reduced and cards are organized.The Back Saver Wallet is made from the highest quality full-grain leather. Taken from the top layer of hide and allowed to remain in its natural state, it is extremely strong and durable. Rather than wearing out, the full-grain leather develops a natural patina, growing more beautiful over time. Available in Brown or Black.